Chonburi is a province located near Bangkok, approximately 80 kilometers, where the major streets as Sukhumvit Road and Motorway (highway #7) also this province. This can helps visitors to get to Chonburi easily. Those who own or rent a private vehicle can visit chonburi within an hour, whereas those who take a first class bus will take approximately one and a half hour. Besides, currently there are also mini buses available at most major areas to transfer visitors to Chonburi. To go to Chonburi from Bangkok with a public bus, the place most visitors usually go to take a bus is Eastern Bus Terminal (Ekkamai). At this place, it is like a hub of buses to provinces in the eastern of Thailand, definitely including Chonburi province. Visitors can buy a ticket at the counter that shows "Bangkok-Chonburi" words. This is a counter of Cherdchai Tour Company, which sell Bangkok-Chonburi First Class bus at Ekkamai. The bus usually departs every 40 – 60 minutes, depending on busy or non-busy period. The bus available from 5.30 AM to 8.30 PM (recently the last bus change from 9 PM to 8.30 PM). The current price is about 80 Baht. This bus will go on Sukhumvit road and after arriving in Bangna, it will go on the tolls way so that visitors can go to Chonburi quickly. Just before getting in Chonburi city, the bus will pass Amata Nakorn Industrial Park, Sripatum University Chonburi Campus. 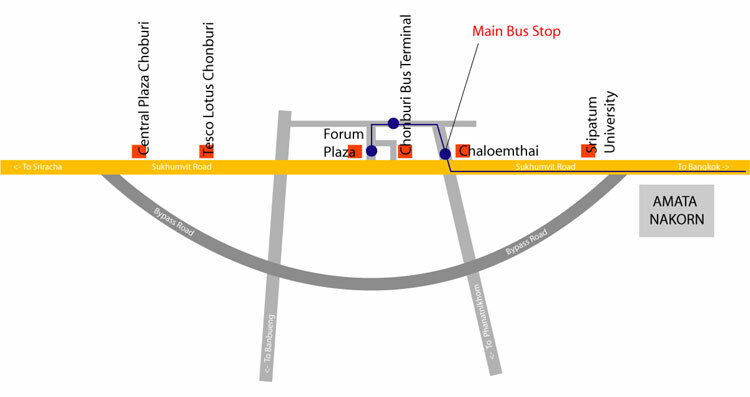 After that, there are two stops that people usually get off the bus, Chaloemthai Department Store, and opposite to Seven Eleven Convenient store at Forum Plaza Chonburi, which is also the last stop. 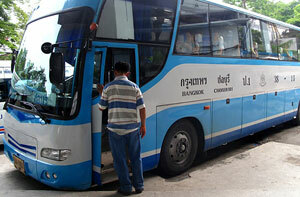 In fact, Bangkok-Pattaya Bus, operated by Rung Ruang Company, can also be an alternative choice for going to Chonburi. However, it can be an interesting choice just when visitors miss the last bus from both Bangkok-Chonburi and Bangkok-Sriracha Buses. This is because its price is more expensive than the other two, approximately 130 Baht. However, at the time you have no buses to Chonburi, Bangkok-Pattaya Bus might still available; the last bus is at 11 PM. Note that, Bangkok-Pattaya bus will go through Chonburi City at the night time only, departure from Ekkamai after 7.30 PM. 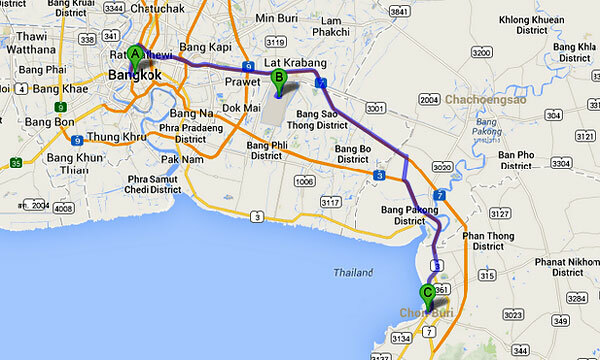 Getting to Chonburi might be more convenient than many other places. Bangkok – Chonburi Bus is not the only bus visitors can take to Chonburi city, but Bangkok-Sriracha bus is also another option for visitors to choose. Before arriving in Sriracha, this bus always runs through Chonburi city (via Sukhumvit Road, not the bypass one). Bangkok-Sriracha Bus also passes Tesco Lotus Chonburi, Central Plaza Chonburi, and Nongmon Market, which the Bangkok-Chonburi Bus doesn't reach these places. However, the ticket price of Bangkok-Sriracha bus is a little more expensive than the Chonburi one, approximately 90 Baht at the present. Somebody would mention about the 2nd class buses from Bangkok to Chonburi. Definitely, there is this choice at Ekkamai Bus terminal, but it is not recommended. The buses usually stop over many times along the way to Chonburi, so it will take a lot more time than the 1st class one, while the ticket price is just a little cheaper. Currently, mini buses transport becomes more and more common in Thailand, because it is used to be a transport choice to many places. 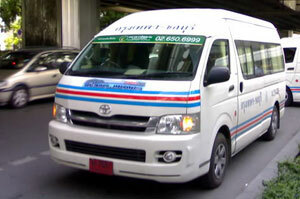 Bangkok-Chonburi mini buses also become more popular to visitors due to its quickness and availability. The mini bus always goes through Chonburi city via Sukhumvit Road. In the case, visitors would like to go to Bangsaen Beach the mini bus usually turn to stop over there after passing Chonburi city as well. 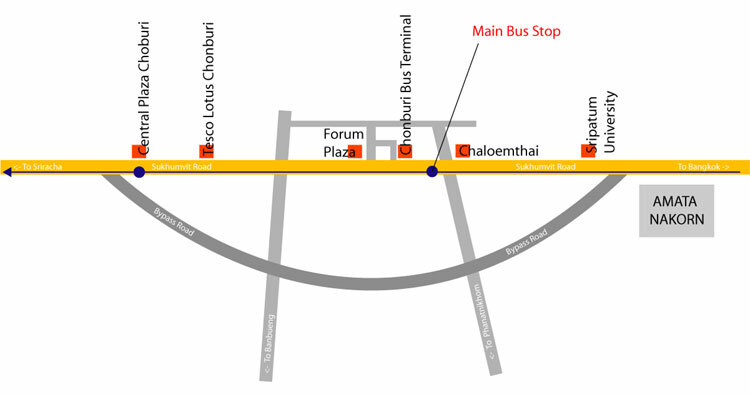 There are three major places for visitors to find these mini buses, Victory Monument, Central Plaza Rama II, and Major Rungsit. The departure time is from 5 AM – 8 PM. This would be the easiest direction to Chonburi. From Bangkok, visitors can just drive along Sukhumvit Road to Chonburi City. There is also a tolls way for those who prefer to visit there quicker, but there is also more cost. 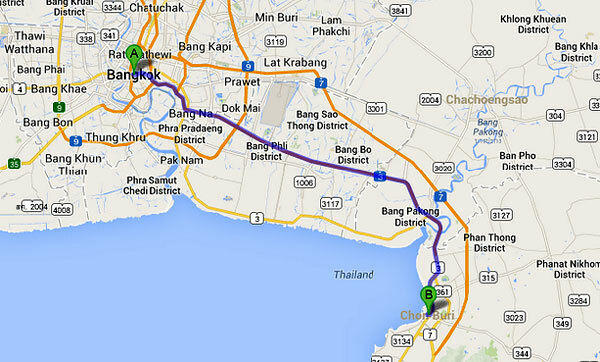 Visitors can get off Bangkok to Chonburi via Motorway (Highway #7). This road will pass Suvarnabhumi Airport. At Chacherngsao, there is a connection street to Sukhumvit Road. 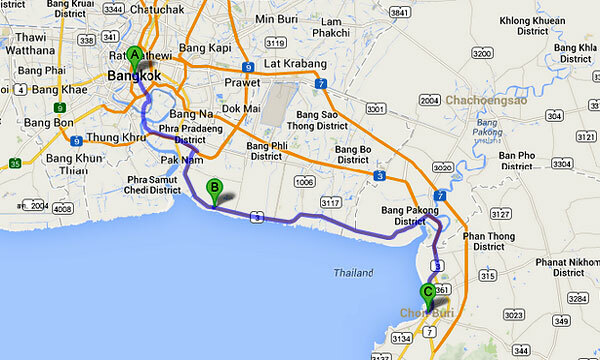 After that just go on a bit to Chonburi City. Route 3: Highway #3 and then Sukhumvit Road. Visitors can also use highway #3 to go to Chonburi, but from Bangkok it will pass the area of Samutprakarn first, and then this street will join Sukhumvit Road near Bangpakong River, which is not far from Chonburi city. For those who want to take a train to Chonburi, there is a daily train from Hualumphong Railway Station, Bangkok, once a day. This train is the 3rd class one, which would take a little more time to visit Chonburi, approximately 3 hours, because the train will stop over a few stations. 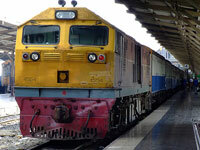 For more information, call +66-223-7010 or http://www.railway.co.th.